The best cat food for urinary tract health is hydrating, promotes a healthy urinary pH, and has the right levels of key minerals to prevent urolithiasis. While there are other risk factors—it appears that feline lower urinary tract disease (FLUTD) is more common among male cats than females, young or middle-aged adults than kittens and seniors, neutered cats than ones who haven’t been neutered—the influence of what your cat eats is the best-understood and easiest to control. Let’s explore the way your cat’s diet affects urinary tract health, identifying which foods are the best for preventing and treating FLUTD. There are four main types of FLUTD and all have a slightly different relationship with diet. Veterinarians arrive at this diagnosis after ruling out bacterial infection or the presence of urinary crystals. Some compelling evidence exists to suggest that stress causes or contributes to this condition. Environmental enrichment and a consistent routine, therefore, can help to manage recurrent cystitis. You’ll hear a lot of people saying that their cat has a UTI, but true urinary tract infections are rare among young, otherwise healthy cats. Bacterial infections are more prevalent among cats over 10 years old and those with other conditions like diabetes, hyperthyroidism, and chronic kidney disease. Urolithiasis is a condition involving bladder or urinary tract uroliths or stones. Though it’s not known exactly how these stones form, we know that they’re composed of an organic matrix and a combination of minerals present in the urinary tract. The mineral composition of a given stone determines its type. Among felines, the most common types of urinary stones are struvite (MgNH4PO4 • 6H20) and calcium oxalate stones (CaC2O4 • H20). While not a formal diagnosis, urethral blockage is a unique situation that occurs for various reasons. It could be caused by a urolith obstruction or a combination of minerals and mucus forming a urethral plug and sealing in the urine. As few as 12 hours of complete obstruction could be enough to cause the bladder to burst. *If you notice that your cat can’t urinate at all, bring them to the vet immediately. 1. Most importantly, the best cat food for urinary tract health isn’t dry. Having evolved as desert animals, cats have an interesting relationship with water. Their low thirst drives and concentrated urine allow them to tolerate life in a water-deprived world. While a cat’s body is beautifully adapted for ripping flesh and chomping bones, it’s not a great drinking machine. A cat might take 2,000 laps to drink a half a cup of water. If he rarely feels thirsty and isn’t very good at drinking, how does a desert cat stay hydrated? He uses his predatory instincts and catches a mouse. A single mouse is 65-80% water, and a diet of juicy prey provides the moisture he needs to stay healthy in an arid environment. Dry-fed cats spend more time at the water bowl and water fountain, but a few drops at the water bowl can’t compensate for chronic moisture deprivation. All water sources considered, cats who eat a high-moisture diet consume two times as much water as those on a dry cat food diet. Adequate fluid intake physically washes out the urinary tract, keeping the system clear and clean. It also moderates the specific gravity or concentration of your cat’s urine, making it more difficult for crystals to form stones. If your cat is a kibble addict—and many cats are—the best thing you can do is gradually switch them onto a wet diet. Some like to dampen their cat’s dry food with warm water, but that’s a hazardous practice. Dry food may be contaminated with fungus, mold, and mycotoxins, all of which thrive in damp environments. If you do moisten your cat’s dry food, don’t leave the soup out for more than 30 minutes. Click here for Dr. Lisa Pierson’s comprehensive guide to transitioning your cat to wet food. 2. It promotes a healthy urinary pH. If the urinary tract pH is too high or alkaline, your cat might develop struvite crystals. A high urinary pH is also a relatively friendly environment for bacteria, increasing the likelihood of bacterial infection. If the urinary tract is too acidic, calcium oxalate crystals could form. Widespread use of slightly acidic cat food to prevent struvite crystals has paralleled a rise in the development of calcium oxalate crystals, which form under low pH conditions. Species-inappropriate foods containing grains, potatoes, and other starchy plant content skew the pH balance towards alkaline. Overuse of prescription foods or other acidifiers could throw the balance in the opposite direction. Cats consuming a species-appropriate, minimally processed diet consisting of muscle meat, bones, and organs have a slightly acidic urinary pH of about 6.- 6.5. 3. It has the right mineral balance. High quality Commercially-sold foods and correctly-formulated homemade foods have the appropriate mineral content for most cats, including many cats with urinary tract problems. A food’s concentration of phosphorus, magnesium, and calcium is primarily a concern among cats with a known tendency towards urolithiasis. Ash is the inorganic mineral content that remains after the organic portion of your cat’s food is burned off during cooking. Because ash is rich in trace minerals like calcium, magnesium, and phosphorus, excessive amounts of this residue could contribute to urinary tract health issues. Look for foods with ash content lower than 2%. Because whole fish is usually ground with bones intact, it’s high in phosphorus and magnesium. Low-quality meat meals are primarily composed of connective tissue and bones, which are high in calcium and phosphorus. Should you feed your cat a prescription cat food for urinary tract health? If your cat has recurrent bouts of urinary tract disease and non-prescription wet food doesn’t help, a prescription food could be your solution. Prescription foods can reduce both struvite and calcium oxalate crystallization. Some only treat one or the other, with struvite crystals being the more common target. They may also have above-average sodium levels. This is intended to make your cat drink more, thereby diluting the urine. If your veterinarian recommends a prescription food, opt for a high-moisture canned variety rather than a dry kibble. This NomNomNow cat food ticks several of our requirements for urinary tract health. It’s hydrating, meat-centric, and low in ash. The recipe features fresh chicken breast, thigh, and liver. Though it’s not a plant-free food, fruits and vegetables constitute a small percentage of each meal and carbohydrates represent about 10% of the food’s calorie content. Remember that meat-based, low-carbohydrate foods have a species-appropriate pH value and, in comparison to alkaline plant-based foods, are less likely to promote urinary tract crystals. NomNomNow is different from the other brands on this list—it’s a cat food subscription service that sends custom-portioned shipments of food to your home according to a regular schedule. Every NomNomNow customer has access to the company’s team of nutrition experts and can ask for personalized advice. Though NomNomNow doesn’t customize the formulations for specific needs, their expert staff can help you to choose the right food for your cat. 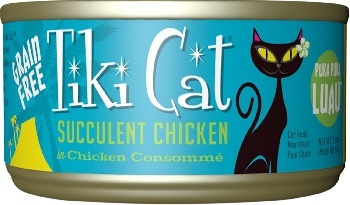 Like other Tiki Cat recipes, this food consists of shredded chicken in broth and oil—a blend the company describes as a chicken consomme. 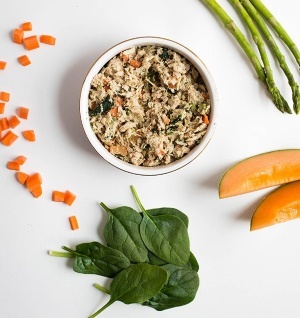 It’s an extremely simple recipe with just chicken, chicken broth, sunflower seed oil, low magnesium and a supplement blend that makes it nutritionally complete. Those concerned with mineral management will appreciate that the ingredient list is free of fish and shellfish. The food’s phosphorus content is about 1.07% on a dry matter basis. The food is 80% water, which is slightly more than the average canned or moist food. Some will appreciate the high moisture content, while others will resent paying for extra water that they could mix in at home. If your cat has continued urinary tract problems after trying a high-quality, high-moisture diet, a a prescription food may be the solution. 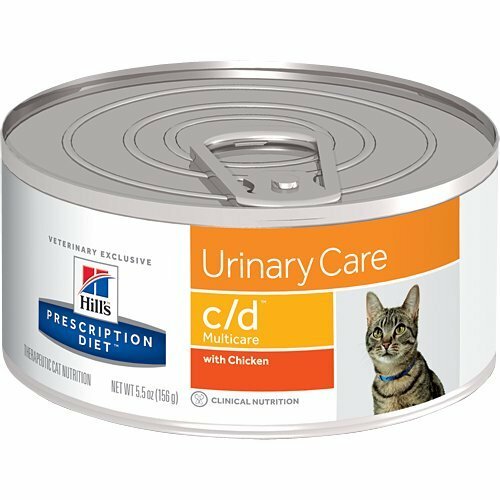 Hill’s Prescription Diet’s c/d formula is “clinically tested nutrition to lower the recurrence of most common urinary signs by 89%”. It helps to dissolve struvite stones and, according to Hill’s, this is a low ash cat food that reduces the risk of both struvite and calcium oxalate stones by promoting healthy pH levels and controlling key mineral concentrations. Its phosphorus content is 0.79% on a dry matter basis. The moisture content is between 70 and 80%, which is on par with other canned pate foods. Like most prescription diets, this food is full of nutritionally questionable ingredients like brewers rice and soybean meal and has a carbohydrate content of around 28%. Like the Hill’s Prescription Diet formula, there’s no pretending that this is a nutritionally spectacular food. That said, there’s an abundance of evidence that this type of prescription diet can benefit cats who are struggling with FLUTD. 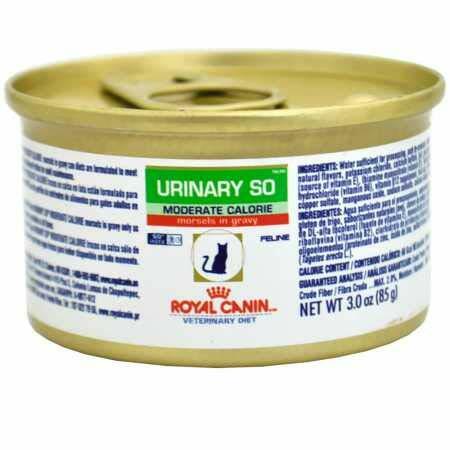 This canned food from Royal Canin promotes a healthy urinary pH. It was formulated according to Relative Super Saturation methodology, which allows it to reduce the concentration of ions that contribute to both calcium oxalate and struvite crystal formation. It’s made with chicken liver, chicken, pork by-products, chicken by-products, and a variety of plant ingredients, including corn flour and modified corn starch. It has reduced levels of magnesium and 0.8% phosphorus on a dry matter basis. With no plant protein and less than 1% carbohydrate content, this is a species-appropriate food that may be able to help facilitate healthy urine pH. 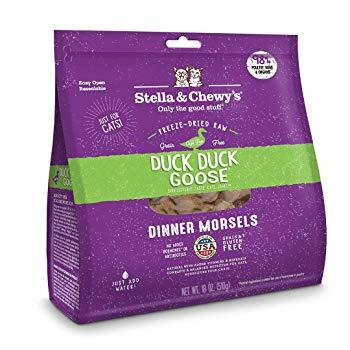 It’s primarily made from freeze-dried duck, turkey, turkey liver, and goose meat. The nuggets come out of the bag at around 5% moisture. You’ll rehydrate them with warm water to achieve the consistency you and your cat prefer. Although you might be nervous about ground bone near the beginning of the ingredient list, the food is 0.68% phosphorus on a dry matter basis. 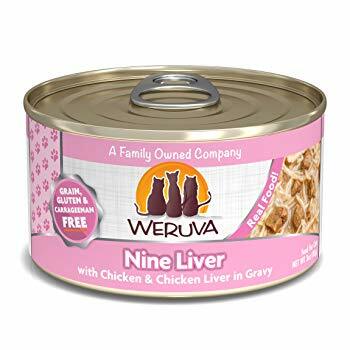 Its shredded chicken and broth make this recipe similar to our first pick, but this food from Weruva has an interesting twist—it contains bite-sized chunks of chicken liver. At 85% moisture, this low magnesium cat food is one of the most hydrating foods on the market. Again, this food isn’t cheap, so those principled against paying a premium for a food that’s mostly water might prefer a different product. The food is 1.2% ash maximum and 1.33% phosphorus on a dry matter basis. Pet Wellbeing has a drop to help kidneys. It has helped my 20 year old for sure. Look at Now cat food low in magnesium and phosporus. Thanks for sharing your recommendations—it’s great that you’ve found something that helps. 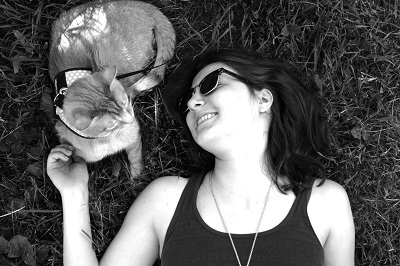 It’s an invaluable resource that covers almost everything you need to know about caring for a cat with CKD. If you don’t have a few hours to read it all today, the site’s worth bookmarking for future reading.